Wolverine Finally Losing His Healing Factor With Age? It's isn't Wolverine's claws that make him Marvel's deadliest mutant, but his unstoppable healing factor - which is finally starting to slip. 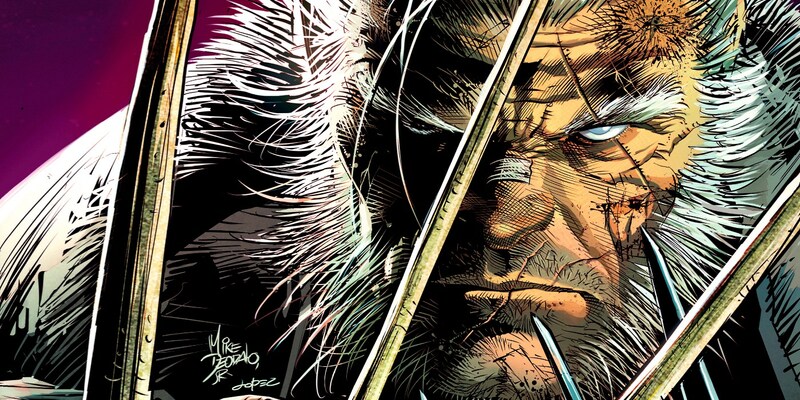 That's the latest twist delivered in the Old Man Logan comic series, following the grizzled and greying mutant transplanted from a bleak, dystopian, alternate future. And with his list of enemies and life-threatening villains not getting any shorter, it's never a good time for his wounds to stop healing. In previous issues Logan has turned to some regenerative drugs to keep him alive and kicking, but it can only do so much. Our exclusive preview of Old Man Logan #39 sees Logan returning to the Xavier School in search of answers. But something tells us the cure won't be easy to come by. Considering his healing factor is what makes him world famous, even the slightest scars or scabs are enough to alert Logan's friends and fans to his dilemma. But the biggest clue is the scar stretching over and across his left eye - a common feature used to denote a true "action hero," but an indication that Logan's problems are going to get worse... since it isn't healing at all. The preview leaves the mystery of Logan's fading powers a mystery for now, and we don't expect the issue to wrap up the storyline when the entire issue is released next Wednesday. Until then, fans have more than just the loss of regenerative mutations to consider. Like the plausibility of a mutant dating app linking those ostracized by society to hopefully find happiness. The cover art for the next few issues of the series shows that these young mutants looking up to Old Man Logan (Glob in particular) may help him get back into the fight. With every single wound threatening to be the last one Wolverine can walk away from, he will need all the help he can get. And medicine. And a cure. Rough days ahead for Logan, that's for sure. LOGAN isn't healing the way he used to. Something is wrong — recent fights are leaving their marks, in ways he's never experienced before. Beaten down, Logan goes to the one people he thought he could always count on for help…The X-MEN. But when an old pupil of Logan's asks for his help, it's Logan's enemies who will learn the hardest lesson: This old dog still has bite. Old Man Logan #39 will be available from Marvel Comics on May 9, 2018.